St Edmund, king of East Anglia became revered as a royal martyr after he was killed by pagan Danish invaders in 870. In the 10th century, his remains were taken to Beodricsworth, which became Bury St Edmund's, where his status of royal martyr saint was promoted. About 985, Abbo of Fleury, wrote the account of his martyrdom and miracles, advertising the holiness of an English king in the face of another invasion of pagan Northmen. St Edmund might have been recognised as the patron saint of the English but for heavy competition from contenders such as Cuthbert and George. 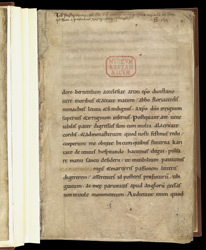 This 12th-century copy of Abbo's account represents continuing promotion of St Edmund the Martyr. At the top edge of this leaf is an ownership inscription and press-mark ('S. 155') of the library of Bury St. Edmund's Abbey. The large space below was left by the main scribe to allow the insertion of some kind of decoration. On this page, Abbo dedicates his account of Edmund's miracles to Dunstan, Abbot of Glastonbury, who had heard Edmund's story at the court of King Athelstan. Years later he repeated it to a gathering of churchmen, including Abbo of Fleury, a monk at Ramsey Abbey in 985-987. The group asked Abbo to put the story in writing. At this time, during the reign of King Aethelred, England was again being attacked by the Danes.